Parting is such sweet cake! This week S2C was very sad to say goodbye to Anne-Marie from her post at Lakeland Arts. In her role as a community engagement artist Anne-Marie has done so much for the Charity. I first met Anne-Marie in the stress and turmoil of the closure of local mental health charity Workbase in 2012. In the very first meeting where five of us proposed creating S2C, Anne-Marie was there by chance on her second day in her new job! We proposed Space2Create and were looking for places to hold sessions and so of course with no real authority to do so Anne-Marie offered us the use of The Lab at Abbot Hall Art Gallery. The rest as they say….history. That insight and awareness of the need and value of cultural engagement for those struggling with mental and physical illness along with the isolation and stigma it entails. This was the start of an on-going relationship with Lakeland Arts that we hope has been as beneficial for them as for us. From our point of view the relationship has allowed us to immediately from the start have the recognition by a large arts organisation of our value and this in turn has given what we do that little bit more weight when it comes to spreading the message…..creativity helps. Access to the exhibitions with the insight and knowledge that has helped so many vulnerable people from S2C appreciate art and its value as well an understanding of what an art gallery is about. We have taken so many people into a gallery who might otherwise never have had the inclination or opportunity to do so. Along with this has been a range of projects where our service users have been able to work alongside some amazing artists in amazing locations. From carving soap in the middle of a Barbra Hepworth exhibition to creating ceramic tiles that were exhibited at Blackwell. As for Anne-Marie, what can I say. The humour, compassion, understanding, thoughtfulness. consideration, dedication, openness, sincerity, enthusiasm, friendship…..you get the idea. To me personally, to the volunteers and to the service users Anne-Marie has always had the time and interest to motivate, support and inspire us all. Finally. the cake. Oh my the cakes. A signature of an Anne-Marie presence is a delicious cake. And so of course on her last official S2c visit she came bearing a lovely chocolate cake! We all wish Anne-Marie the very best for the future and we are very certain we shall be keeping in touch. We now look forward to the future and continuing to build on the relationship with Lakeland Arts alongside the new person in that role, charged with engaging the community. I do intensely dislike interviewing or being interviewed. It’s the sensation of interrogation, no matter how hard you try to be relaxed about it, that really puts the frighteners up me. This week we were in the position of being the skills vampires. As a manager of a charity one always feels akin to the legendary vampire, having to smooth talk the victim into submission before sucking them dry. It is very much like finding volunteers and bleeding them of their time and skills! Not true of course, I value and appreciate everything everyone does but one does end up feeling constantly on the take. It occurred to me this week after interviewing several people, well actually several things occurred to me, just what an eye-opening experience it was. For a start I learned a number of key indicators about how S2C is perceived, its reach into the community and how other people see its strengths and weaknesses. Each candidate for the job brought with them some fantastic observations of what was going on at S2C and in most cases some very good ideas of how things could be improved. I have to admit that some of the ideas were excellent and having heard them all I now have collected a selection of possible actions that would greatly improve aspects of S2C which is while I feel somewhat vamperic! The other thing, well two other , no three things to say about it all! First, we have made links to some very skilled and passionate people who we will look to work with in the future even though they didn’t get the job. Secondly, we were blown away by the passion all the candidates showed for S2C and how they all clearly believed what we were doing was important and meaningful. Finally, we ended up with an excellent person in the role. I shall put my vampirey tendency to one side for a while now as |I have had my fill of fresh er….. ideas and will hopefully see S2C continue to develop and deliver more to support those in need in the community. 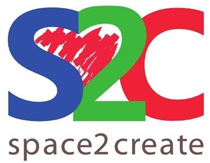 I am always keen to promote what a friendly, safe and welcoming creative place S2C is. Yes there is a lot of laughter and creativity and fun and talking. It is all part of the feel of the place that is deliberately encouraged for the support it gives to vulnerable people. It is very easy to dismiss all this as rather frivolous. From the casual glance a room full of adults laughing and joking, talking, painting a whole range of pictures at a wide range of standards appears to be a very simplistic dynamic. However one or two things have happened recently that have just reminded me of how much more goes on under the surface. Hidden from the casual viewer are the individual stories of people in real crisis. For some it has taken immense courage to even get out of the house fighting insecurity, paranoia, fear, despair and pain to make it. It’s about the person who has been trapped in a life they don’t feel they belong in being supported to make the changes and move forward, having somewhere they can go where they are not judged or expected to be somebody they are not. It’s about the person so fearful of harming themselves when they are alone coming to be with others to be safe, wanted and respected. It’s about the individual afraid to go out or be with people being left by their support worker on their own but with a friendly, understanding and supportive group helping them gain confidence. It’s about the person fighting with their bi-polar disorder being with people who understand that sometimes they are with drawn and quite and other more manic and intense. It’s about that person who spends so much of their life in chronic pain they feel isolated, lost and in despair of ever being able to be happy finding a moment to laugh through their pain. I could go on because nearly every person in the room, including the volunteers, has a reason to need support. The fact that a casual observer can look through the window and see a group of adults sat round talking and laughing, smiling and being confident, that tells me we have achieved our aims at S2C. Maybe those casual glancers should stop to ponder more at what is going on and realise that among us are many for whom the bright moments in their lives are few and far between. They need help to bring them about and learn to find them in their lives so they can move forward and get back to being an active part of our local community more happily. All for S2C and S2C for all……. One of the things I constantly get asked about is how I manage to run S2C. At times I am not quite sure how it works. Yes there has to be somebody where the buck stops and who has the final say yes or no. Buy actually, the nature of S2C as an organic ongoing flowing family of service users, volunteers and trustees, almost runs itself at times. Personally, the issues I have to deal with, mean sitting and getting down to something is difficult (and often painful). I can’t do one thing for an extended time before something starts reacting. So I work in small chunks….half an hour on one thing, change to something else for a bit, rest, twenty minutes here and there. At anytime from five in the morning to midnight. As long as it gets done…… Its fortunate that S2C can be run like this, it would not be true of many roles. The last week has been a case in point. With an injured hand there have been things I cannot do at the moment but a whole range of people from volunteers to the service users have jumped in to help out. I missed Fridays session completely and again there people there to take it on and do it instead. Not only that but do it extremely well. At S2C everything is shared to some degree involving the nuts and bolts of making the organisation tick along. obviously there is a limit to confidential elements and there will always be certain tasks that require specific training. It is in this atmosphere of acceptance and support that individuals who are lacking confidence and esteem can grow and become more confident. and independent. We work very hard to keep the friendly, accepting, tolerant, open, supportive and positive vibe that exists at S2C. We want people to grow and reach out to achieve personal goals and move forward into society with more confidence and self belief.